Are you a new ESL teacher, or a teacher working to improve your classroom? You’re probably looking for ways to maintain an orderly classroom, not to mention create a positive, calm learning environment. Even if you’re an experienced teacher, you may be struggling to make your class better behaved and more focused. The truth is that maintaining a great ESL class is hard — and you can’t do it alone. You need to work with your students continually to create a classroom full of people discovering and helping each other question and learn. Fear no more, because you’re about to learn how you can create a path to more rewarding and full ESL classes by establishing and maintaining classroom expectations. Best of all, you’re getting the inside scoop on the three expectations that are key for creating a great classroom, along with tips for adapting them to suit your teaching style! How Do I Make My Classroom Expectations Matter? Too many teachers fall into one of these two traps: either they’re totally strict and spend more time disciplining than teaching, or they’re too wishy-washy and end up letting students watch movies and read during class because they’ve just given up on maintaining control. The key to changing that is setting classroom expectations. Good classroom expectations — not classroom rules — involve students in setting up the structure of a class. Classroom expectations set the tone for your class, creating a blueprint that guides the way both you and your students behave. Set up classroom expectations on the first day of class, and do it with your students. Creating classroom expectations as a class is important because it gives students ownership of their learning and makes them invested in the guidelines. If you’re teaching very young students, you may have to lead the discussion about classroom expectations more, but you can still let students use TPR (Total Physical Response) and single words to give input! If you have older students, you can have them split into groups to brainstorm rules or get together as a class to think of some. Make sure to enforce that these are expectations and not rules, and so they should be simple and positive. They should be guidelines that encourage participation and discovery, not a laundry list of dos and don’ts. As students brainstorm expectations, write them down and condense them. Lots of students will probably think of ideas that are variations of a theme, and you can facilitate their thinking process by condensing ideas or combining them into one guideline. Have students write the final list you come up with on posters that they can decorate and hang around the classroom! That way they’ll have a reminder of the expectations all semester — in their handwriting. Note: Every ESL classroom is different, so these exact expectations may not be for everyone. You may want to expand on them or adapt them, but I encourage you to use them as a blueprint because I’ve found that they’re the bones of what makes a good ESL classroom. Best of all, they can be adapted for any age of learner because they’re really simple and really universal. This one’s kind of a no-brainer, right? Anyone learning a language needs to speak the target language if they want to learn it, and they need to hear it, too. A classroom full of people speaking English is a classroom full of people practicing using and listening to a new language; it’s a classroom full of people learning. Notice that I didn’t say “No Chinese” (or “No Spanish” or whatever language), because the point of this expectation isn’t prohibition. We don’t want to bar students from speaking their native language or focus on negatives. Instead, we want to emphasize that this space is for learning English. We all speak English in English class so that we can all learn English. This expectation is probably the most broadly applicable one, but its generality doesn’t make it unuseful. 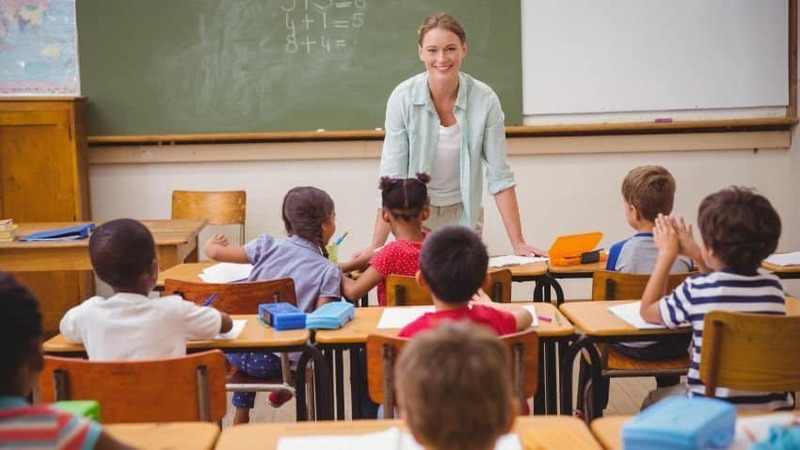 In fact, “Be Respectful” is the cornerstone of the classroom: it sets the entire note for what kind of class yours is and how students should behave in it. You can adapt this classroom expectation for different ages. For very young students, for example, you can say “Be nice!”, and pair it with a movement like bowing or doing an exaggerated, fingers-on-your-cheeks smile. Talk to the students about what this expectation means: it means not defiling classroom property, not hitting or biting or saying mean words, not running around during class or making fun of people. Being respectful means trying hard, helping others, and not laughing at them. Your students will be eager to give examples of respect, and maybe even illustrate them on their posters! Bonus idea: With your students, think of other things you want your class to respect! Perhaps you can say “Respect the Earth” and encourage recycling and other acts of environmentalism? Make this your own, and give your students’ interests and concerns a platform. This last one seems repetitive. I mean, this is a form of respect, right? Yes, it is! But here’s the thing: it’s so important, it’s worth writing separately. If students are talking over each other, talking over you, then no learning can get done and the class goes to chaos. Establishing this expectation gives you the tools to establish others and conduct a calm, productive class. Even though it’s redundant, put it down. You’re going to be happy to be able to point to this classroom expectation clearly on the wall when students are yelling over one another and you think you’re about to lose your cool. Tip: If you teach younger students, you can reduce this rule to “Listen!”, paired with a cupped hand behind the ear. Great list, you’re thinking, but how do I put these into action? How do I use them to create real change in my classroom? The trick to making your expectations matter is making them clear — over and over and over again. If you have young students, you can chant the expectations call-and-response style with accompanying motions for the first month of the year or even longer! The best way to encourage behaviors is through positive reinforcements! Rather than focusing on bad behaviors, reward students for trying, for being respectful, for really showing up and learning. Before you know it, your students are going to be so eager to do well and act well in class that they’ll be doing your job for you! So set out classroom expectations and positive rewards and let them work their magic. Hello and thank you for this very informative mail. Strange that you should mention the third classroom expectation, as being a “no brainier” or even “redundant”! Listen when others speak, is in effect a no brainier, and something ESL students are very much aware of, regardless of their age. My experience has taught me, that this is indeed, the most difficult, if not nearly impossible, expectation to have. Very often these students are so hell bent on being “listened to”, that they would use any means, to make that happen. It entices competitiveness amongst them, and also seems to act as a precursor in their popularity stakes, amongst their peers of course. I would like to engage on this point, further, should there be like minded individuals, who experienced the same, and are willing to share. Thanks again for a very interesting and helpful discussion on ESL Teaching. Thanks so much for reading and commenting, Shantha! You’re totally right — being listened to is urgently important, not just for ESL students but for everyone. The goal in setting these expectations at the outset is to create a classroom culture of listening and respect before it devolves into popularity contests and hurt feelings (although some amount of that is of course impossible to avoid). I’d love to hear your strategies for creating a more positive classroom culture where students listen to one another and, most importantly, feel heard!